As an online editor, one of the most common questions I'm asked is, "how can I compress my film for web distribution, like YouTube and Vimeo?". Although this is an extremely complex subject that used to be its own profession, known as a compressionist, I figured I would provide some guidelines for best results when exporting a file for web distribution. While I'm showing these guidelines in Adobe Media Encoder CC 2015, these tips are are useful for any application that encodes H.264 (Compressor, Handbrake, Squeeze, etc). Encode a "master" file using a high quality codec such as Apple ProRes, Avid DNxHD, GoPro Cineform, etc. Anything that supports 10 bit and allows you to set 4:2:2 or higher color subsampling. 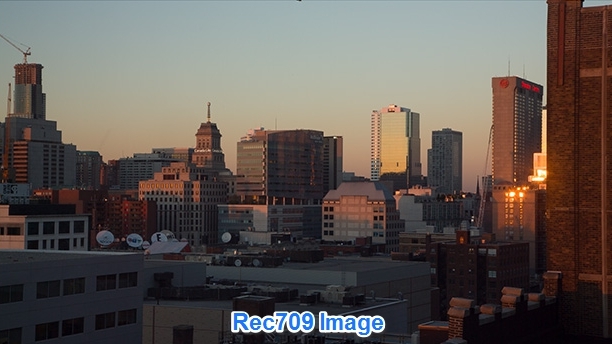 This is the source video file we will use to convert to a smaller, web friendly H.264, as it tends to result in higher image quality than directly exporting to H.264. This "master" file is also a great file to archive for long-term backup, as it is far higher quality than the web version we will encode. Resolution: 1920 x 1080 or 3840 x 2160 (UHD aka Online "4K") - you can reduce 1080 if you are using a different aspect ratio from 16:9, such as 2:35, to "cut" off the black bars, but they will likely be added back on most displays when played back. 720p is also acceptable to save bandwidth, but will slowly become obsolete as services update with technology. Frame Rate: 23.976 (or 25) - depends on your location and how it was shot. Avoid adjusting from the source resolution, unless necessary. (Pixel) Aspect: Square Pixels (1.0) - unless you are encoding anamorphic for final delivery, use the standard Square Pixel 1.0 for HD and UHD material. If Standard Definition, it may require a different setting like .991. TV Standard: Depends on your location. Check your source material, as it will usually indicate. Profile: High - This is a very important option, as many presets set this to Main. Make sure this is set to High for best quality. Level: 4.2 or above - 4.2 is generally good, as the higher you go, the less compatible it is with et-top players like PS3, Roku, Chromecast, and others. Render at Maximum Depth - Checked (Adobe specific option) - This is another important option as it provides for higher quality color processing at the expense of encoding time. It is usually worth the small hit to render time, in my personal opinion. In other encoders, this may be shown as the "bit depth" used to encode. The higher the bit depth selected, the higher precision of color processing used to encode the file, at the cost of render time. Bitrate Encoding: VBR, 2 Pass - VBR 2 Pass will provide the best quality AND the best file size for that quality by reviewing the file twice, to most efficiently distribute data throughout the length of the file. VBR 1 Pass is still very good, although the quality may not be quite as high as 2 pass. CBR doesn't look at the file contents at all, just providing a specific bit rate at all times. Target Bitrate: 25-30Mbps - This is HEAVILY dependent on the content, with more movement and fast cuts (Ex: generic action films) requiring more data than something that slowly moves (Ex: generic romantic comedies). Also, the more grain or noise, the more data required to maintain that image without turning into a blocky, compressed mess. Maximum Bitrate: 50Mbps - This is the maximum bitrate the encoder can use, period. The variable bit rate may decide this exact moment is particularly intense and requires a lot of data, and this is a "ceiling" of sorts for the bit rate. Key Frame Distance: Unchecked - This can be used to force a keyframe every # of frames, but will up the data rate. Use Maximum Render Quality - Checked if using ANY type of scaling during the edit (punch-ins, re-positions, etc), FX that scale like Warp Stabilizer, or exporting to resolution different than source. - This option greatly helps scaling quality, both when upsizing & reducing resolution, and with effects that use scaling, at the expense of render time. If you are unsure, just enable it and deal with the additional render time for better quality. If you know you are not doing any scaling at all, effects of manual, leave this unchecked to save on render time. Audio Format: AAC (or AAC-LC) - Compressing the audio to AAC is the preferred audio format for both Youtube & Vimeo. Bitrate: 320kbps - This is a good audio bitrate for 90% of videos, unless it is a studio mastered audio track. I hope this quick breakdown of my H.264 encoding workflow helps with your own encodings. I encourage you to experiment with the above and tweak them to fit your own content and preferences. Please leave any comments, thoughts, and feedback below, if this has helped or given you some ideas for your own workflows. I personally feel Magic Lantern is the best thing to come to Canon DSLRs since sliced bread, especially it's ability to shoot in 14-bit RAW at 1080p HD. It's truly incredible that an open-source software "hack" can bring life to an aging camera line that allows it to outclass even some newly released cinema cameras, both in image quality and flexibility in post production. They can not shoot 4K, but Magic Lantern RAW can produce some incredible imagery that truly prove that expensive gear does not define a cinematographer. Unfortunately, anyone who has worked with the format can also attest to it's long winded post conversion workflow. This article aims to help you through that process, so you can capture images like the below (Just look at the detail in the fire!). In a previous article, I detailed how you can work with Magic Lantern RAW quickly and easily, decoding almost directly to the high quality edit-friendly Apple ProRes format. My purpose for that experiment was both to see if I could figure out a "simple & reliable" workflow to use for ML RAW (mlv file format) and to see if it would hold up during post production processing. This follow up article aims to refine that workflow for more control over your color correction, at the expensive of processing time and storage space. 1. You will need a massive amount of hard drive storage on set. Each hour will eat up around ~350-400GBs, depending on the exact resolution & if sound is recorded. Make sure you have a few HDDs to offload and back-up footage. 2. You SHOULD have a DIT on set who does nothing but offload cards and check the MLV files, if the production has the budget or you can wrangle someone to handle this very important task. Its not very glorious, but if you need to reshoot something, it is FAR easier knowing that fact a few minutes later instead of while watching dailies. 3. Each 64GB card will only hold between 11-22 min of footage, so you will be switching cards quite a bit. Think of it like you are shooting film, and you have to plan more carefully. It may be a limitation and CAN kill time, but not if you plan around it. Bring a least 3 1000x (or faster) CF cards and\or have an organized and efficient cycle of downloading the CF cards to avoid too much downtime. 4. While the camera could have the occasional "crash", no need to panic, as cycling the camera on\off or pulling the battery will almost always fix it. Some models (5D Mark II, III) are far more stable than others (7D, 6D). This article is written from the perspective of working with the least stable model, and I've had only a few issues. I had done plenty of testing in preparation while testing the previous workflow, so it wasn't new of territory this time around. After going on a trip to Alaska and shooting a short nature film, I designed a higher end "feature" workflow using CinemaDNG as the "online" format instead of ProRes444 to retain the most information captured by the camera. The "Quick & Easy" workflow worked flawlessly, but I knew I was throwing out a lot of control in color correction by simply converting to ProRes. As this was a creative passion project, I wanted every bit of visual information I could capture. Here is that CinemaDNG workflow, and it happens to work for both Mac and PC, although you use a different program for the initial conversion. It's fairly straightforward, with many steps the same as before. 1. Copy your .RAW or .MLV Files from your CompactFlash card to two hard disks while on-set, one for back-up purposes. I suggest you establish a "cycle" of checking, dumping, and formatting the CompactFlash cards if you do not have a DIT, to avoid any data "accidents". 2. Review files on-set with MLRawViewer (Latest Version as of writing is 1.3.3). This software is great, as we can use it to review shots on a laptop on-set if needed for focus. This will also confirm if any files are corrupt or damaged, as the on-camera raw playback is still finicky. 3. Once back at your main editing computer, it's time to decode the proprietary RAW \ MLV files to standard CinemaDNG images sequences. If you are on Windows, I recommend you use Raw2CDNG, which happens to be free and open source. If you are on Mac OS X, I recommend RawMagic Lite \ RawMagic, which will do the same conversion to CinemaDNG. If you are ready to "wash your hands of it" and be done about now, I suggest you take a look at Pomfort Cliphouse for a quick way to finish your RAW files without going into additional applications, but it is another software package you would need to purchase. 4. Awesome! Now that you have successfully converted your proprietary .RAW or .MLV files to standard CinemaDNG sequences, we can get started color correcting or editing. Most computers aren't fast enough to edit CinemaDNG sequences in real-time, so we'll be using an an "online\offline" workflow. It sounds fancy and complicated, but it simply means you edit with lower quality "proxy" files that you "relink" back to the high-quality CinemaDNG files during color correction \ online finishing. More information about creating proxies files in DaVinci Resolve can be found here, as that's not the exact focus of this article. 5. If you have successfully converted all of your footage to CinemaDNG without any errors, you can likely delete the MLV \ RAW files, if you find yourself needing storage space. 6. Next, we interpret our footage as "LOG" so we have the most color range to work with. If processing in Resolve, you won't need a LUT or ACR profile. If you would like to process in Adobe After Effects, Download and install VisionLOG or purchase BMDFilmVC (recommended for Adobe Camera Raw workflow). This ACR profile will convert our footage to have a "logarithmic" (aka "LOG") gamma curve, which allows the use the entire dynamic range captured and give you a lot more "head room" to color grade, despite now looking "flat" and "washed out". If your brain is spinning, it's totally understandable, but it will make sense shortly. This conversion also makes your footage compatible with a large variety of plug-ins, LUTs, film stock emulations, and any color grading options that supports a LOG style input, similar to cineon (how film was digitally captured when scanned), Arri LogC, and Red Log Film. Of course, you can also grade the footage completely manually by hand, with the enormous flexibility allowed using RAW CinemaDNG sequences. 6a. If working in DaVinci Resolve, make sure to go to the camera RAW tab in settings, select CinemaDNG, and change "Rec709 "to "BMDFilm". This is how we tell Resolve to interpret the CinemaDNG files as "Log", similar to the BMDFilm gamma curve Blackmagic cameras shoot in. Also, in newer versions of Resolve (11.1 and later), there is an additional option called "pre-tone curve". For best results, disable "pre-tone curve" unless matching to older material. 7. Color grade until satisfied in Adobe After Effects of DaVinci Resolve. You can color using tools like the 3-way CC, Curves, LUTs, plug-ins such as FilmConvert, etc. 8. Export back to your editing platform of choice using XML or AAF OR export single final master file using ProRes, DNxHD, GoPro Cineform, or your choice of high quality master format. I highly recommend you master & archive your projects using a high quality intermediate codec, and not a highly compressed format such as H.264 or MPEG-4. Export both if you must, but keep a HQ version. Perosnally, I am using GoPro Cineform HD or ProRes444 to archive my projects, as they retain almost all of the quality of the original. 9. Kick back and enjoy your footage. This workflow might require a lengthy RAW/MLV to CinemaDNG conversion, but we end up with beautiful, uncompressed CinemaDNG sequences (which can be further compressed WITHOUT losing data with a utility like SlimRaw). Next, we color grade our CinemaDNG files in DaVinci Resolve or Adobe After Effects (via Adobe Camera Raw) using whatever methods you are most comfortable with, whether 3-way CC, Curves, LUTs, plug-ins such as FilmConvert, Magic Bullet, other built in tools, etc. My point is you can color grade however you choose, in either application. DaVinci Resolve is my personal choice for professional color grading, but After Effects is plenty powerful, requires far less of a computer, and especially now with mask tracking, is quite capable of being used to color correct (Just ask Stu Maschwitz....). Shooting RAW provides numerous benefits, such as an amazing amount of precision in color correction and visual effects (such as green screen keying), while also working in several applications, so you aren't locked down to a specific color grading platform. The negative side of working with RAW is the additional storage and processing power required, as most RAW formats typically require a very fast computer in all areas (CPU, GPU, and HDDs) to debayer & playback raw media in real-time. 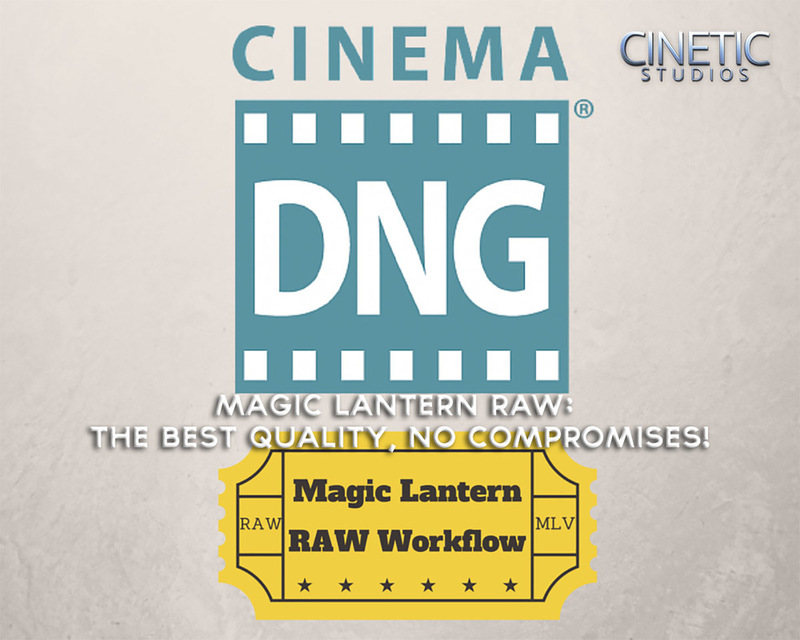 I hope you found this overview of the Magic Lantern Raw to CinemaDNG workflow useful. Please leave any comment or question below. Refer to the the specific application's websites\ forums for more information, shortcuts, and updates to the software. Thanks to MTS Films for the footage example and HackerMovies for the photos. Disclaimer: Although I feel this should be assumed, I am in no way affiliated with any of the software packages I mention in my articles. Anything I mention about a product, service, or individual is completely my own opinion. GoPro Cineform : A fast cross-platform solution? UPDATE: 7/2/2015: Cineform goes official! Cineform has finally been accepted as "VC-5" by SMPTE. As such, GoPro will soon be updating the free version of GoPro studio to allows encoding of Cineform HD 16-bit RGB and 10-bit YUV from any application including DaVinci Resolve. A Pro or Plus license is no longer required, as was previously necessary to use outside of the Adobe applications and GoPro Studio. Based on testing with a wide variety of source materials, I found it best to use the Cineform encoding setting that avoided color space transcoding between RGB and YUV. In other words, if you are working with H264, 4:2:2 or YUV material, it is best to use the Cineform YUV 10-bit option. If you are working with RAW, 4:4:4 or RGB data, Cineform RGB is the better option. I noticed this mainly in Resolve outputs, although it is likely valid in any application using the codec. Also, you may need to specify "data" in the DaVinci Resolve export settings, as auto was not working as of version 11.3.1. UPDATE 10/31/14: Per Tim Tim Kurkoski from Adobe, The GoPro CineForm codec can encode pixels in YUV 4:2:2 at 10 bits per channel, or RGBA 4:4:4:4 at 12 bits per channel. The presets are incorrectly named with YUV 8-bit, and will be updated in latest versions of CC. If you're an Adobe Creative Cloud subscriber, you've had a lot to be happy about with the recently released 2014.1 update (which can be reviewed in its entirety here). One major feature that most likely won't even notice is the inclusion of a new codec called GoPro Cineform. It is hiding within the video codec menu, if you export using Quicktime Format (see picture below). The Cineform codec isn't technically anything new: it's been around for a while and still has a small but loyal following, but due to it's requirement of additional software, many were discouraged from using it. The RAW version of the codec also requires a fairly expensive license for the premium version of the GoPro Studio application. It also got a recent surge in popularity when Cineform was purchased by GoPro and integrated into the GoPro Studio suite of tools. Why Should you care? You're probably happy with either Apple ProRes or Avid DNxHD, and could care less about switching your workflow up. Here's a few possible scenarios that could benefit from access to a cross-platform codec, such as GoPro Cineform. One issue could occur when you collaborate with multiple artists, especially on different platforms, which all have different capabilities with codecs. However, even if you are working alone, or on a single platform, there is still a good reason to consider using Adobe's new implementation of the GoPro Cineform Codec, simply due to its improvements in encoding speed. Cineform is a fantastic intermediate codec that renders extremely quickly (within Adobe Media Encoder using a Quicktime MOV file wrapper) and can be virtually lossless, depending on your quality settings. I've done a few render tests using a several different sources to see how fast it really is: an Avid DNxHD 175 10 bit 1080p source, a RED Epic 5K source @ 1080p, and a 1080p ProRes444 source. 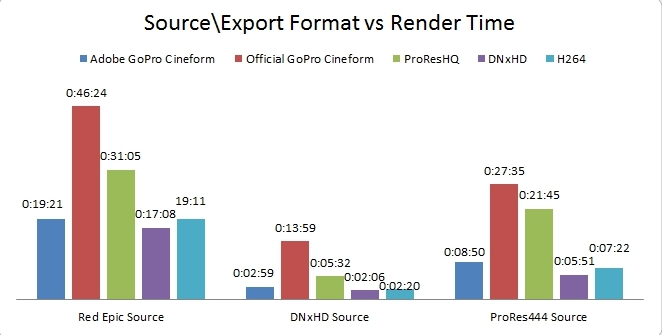 Below I've listed the render times for each project rendering to Adobe's new native GoPro Cineform (16bit with alpha preset), the older Cineform codec previously available directly from GoPro (Film Scan 1 4:4:4 RGB), H264, Avid DNxHD 175 10bit (as an mxf), and ProRes422HQ (this is being rendered by an unofficial ProRes codec, so the results are just for generic reference overall). With the exception of H264, all of these formats are good intermediate codecs that will work well for use during production & post-production. Why not use the one that encodes the fastest, works on the most machines used in your workflow, and provides a visually lossless image (which they all will do). As you can see, while GoPro Cineform was unacceptably slow using the official encoder, it jumps ahead to almost the fastest using Adobe's implementation. While I don't personally feel there is one "perfect" codec for archival or mastering, I will certainly be using the GoPro Cineform codec built into the latest version of Adobe's Creative Cloud far more often whenever I need a high quality intermediate codec to round-trip between applications or to archive my projects in the highest possible quality. If you have the latest version of Adobe CC, I urge you to experiment with this codec and see if it has a place within your workflow, where you previously may have have always used Apple ProRes or Avid DNxHD. Make sure to download the GoPro Studio application from GoPro's website to play GoPro Cineform files outside of Adobe Premiere. Adobe GoPro Cineform setting was q=5 (film scan 2 - rigorous post) for all tests, with max bit depth the 64 bit setting enabled. Official GoPro Cineform codec settings were RGB 4:4:4 I-Frame Only Film Scan 1. Enabling 32 or 64 bit enabled alpha channel.